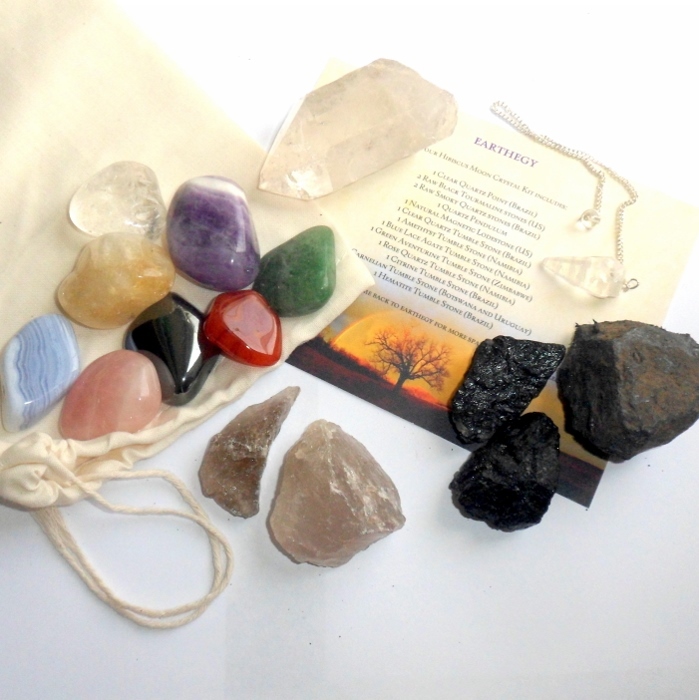 The kit includes tumble stones in clear quartz, amethyst, blue lace agate, green aventurine, rose quartz, citrine, carnelian, and hematite. 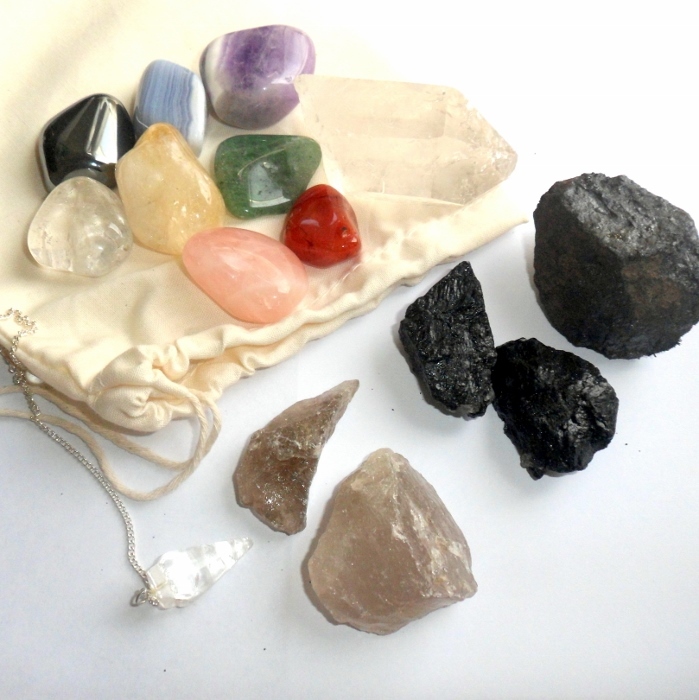 On top of that are two raw black tourmaline stones, two raw smoky quartz stones, and a raw naturally magnetic lodestone specimen, a clear quartz pendulum, a quartz wand/point, all tucked into a cotton muslin bag. 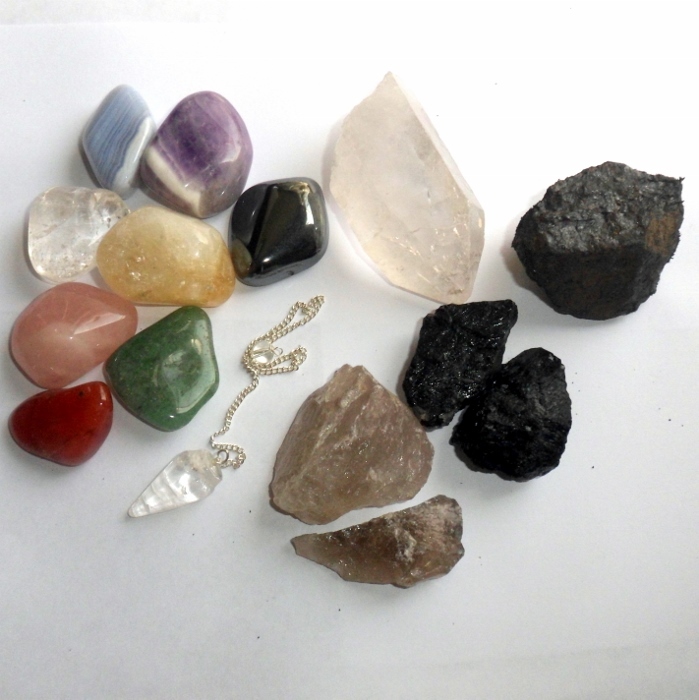 The tumbles stones vary slightly in size and are all superb high quality polished, hand sorted specimens. Average stone sizes range from 3/4 inch to 2 inches. The clear quartz, citrine, and hematite were all mined in Brazil. Green aventurine is from Zimbabwe. Amethyst, blue lace agate, and rose quartz were all mined in Namibia. Carnelian was mined in Uruguay and Botswana and have some color variation in each individual kit. Raw tourmaline and smoky quartz stones range from about 1 to 2 inches each. Smoky quartz is high quality from Brazil, and some of the stones have natural rainbows in them. 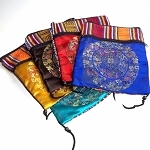 Lodestone specimens are 100% naturally magnetic, average size 2 inches. Quartz point specimens range from 2 to 4 inches, some will be shorter and chubbier, some will be longer and narrower, a few have natural rainbows inside them, and a few have double points. 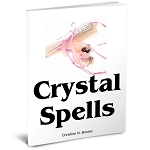 Clear quartz pendulum is approximately 8 inches long. 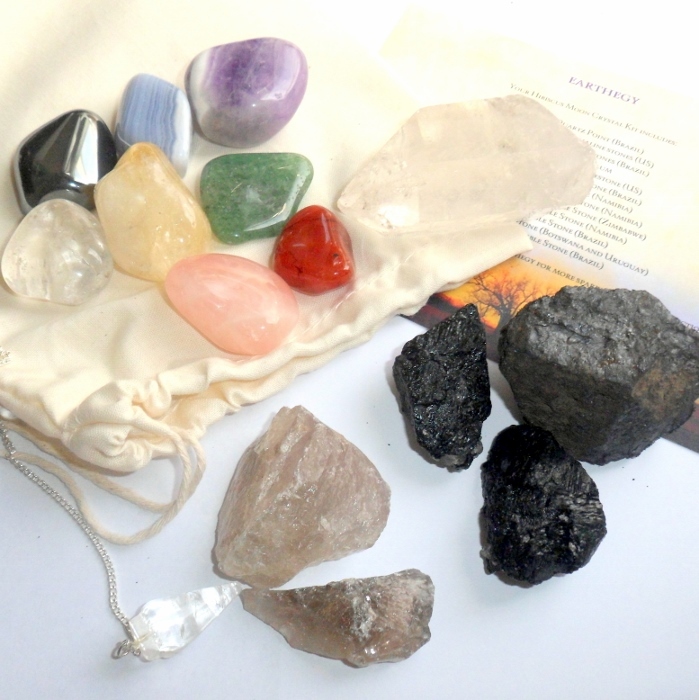 All stones in the kit are guaranteed to adhere to the course requirements and sizes necessary for Hibiscus Moon Crystal Academy's Basic Crystal Healing course.